Importance. -- This beetle occurs over much of the East and attacks maple and white oaks and, to a lesser extent, the red oaks. It bores into the trunks of live trees of all sizes. Damaged wood is degraded for such uses as veneer, cooperage, and furniture. Identifying the Insect (figure 25a). -- Adults are black to reddish-brown, cylindrical beetles about .2 inch (4 mm) long. The larvae are white, legless and C-shaped. Identifying the Injury (figure 25b). -- Holes less than .1 inch (1 to 2 mm) in diameter, are bored straight into the sapwood until the tunnel nears the heartwood, then it turns right or left. Damage is conspicuous in log ends. Streaks of stain originating from the tunnels are known as flagworm defects. Biology. 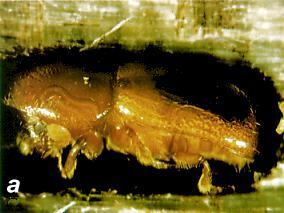 -- Adult beetles construct galleries. Eggs are laid in chambers along the main tunnel where the larvae live and develop. Larval food is a white fungus that grows on the gallery walls. There are two to three generations per year. Control. -- There is no apparent relationship between tree vigor and susceptibility. No natural enemies have been found. Figure25. -- (a) Columbian timber beetle adult in brood cell; (b) columbian timber beetle galleries and "flag" stains in white oak.